If you have any questions just call Nicci or Jonny on 07514324455, email stays@copperpotcottage.uk or use the enquiry form at the bottom of the page. Hello! We're the Millar family and we own and run Copperpot Cottage. 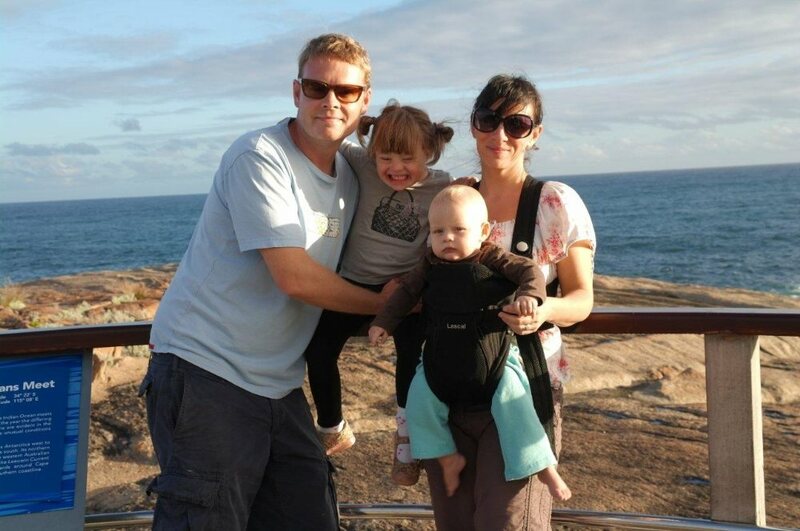 Jonny, Anna, Nicci and Jemima (in the pouch). Here are answers to a few questions you might have about a stay at Copperpot Cottage, as well as booking and payment information and terms and conditions. As much as we love them, we are a pet-free holiday cottage. I am a wheel-chair user – is the property suitable for me? I have limited mobility - is the property suitable for me? There is a step at the front door and several steps at the back door. Given all the bedrooms and bathrooms are upstairs and there is no lift, we are sorry to say Copperpot Cottage wouldn’t be a good choice for wheel-chair users. Guests would need to be comfortable walking up an internal flight of stairs. There is a separate bath tub and walk in shower. The twin bedroom would be ideal for children. The kitchen is equipped with unbreakable plastic beakers, plates and cutlery. There are board games and DVDs suitable for the whole family. Plus, we can provide much of the kit and caboodle needed for travelling with babies and young children – cot, high chair, pram, toys - just ask us. The back garden is enclosed with a lockable gate. We have designed the property with the safety of all our guests in mind, but the property isn’t child-proofed and children would always need adult supervision. No parties/events/additional overnight guests. We can accept family groups of up to 6 people. We cannot accept groups of 5 or more adult friends. These are all at the cottage and included in the price. The kitchen is fully equipped to meet and exceed NITB requirements. For example, our kitchen has everything from a range cooker to pestle and mortar, loaf tins, pinny to a dishwasher. There is a separate drying room with a washing machine, a tumble dryer and iron/ironing board, along with clear instructions for operating the machines. Portrush town centre is less than a mile up the road. There is a Eurospar a few hundred metres from Copperpot Cottage selling milk, bread and other provisions plus logs and fuel. It is open 7 days a week from 7am until midnight. There is also an Ulster Bank ATM. Yes. We’ll be at the cottage to greet you, show you around the property and leave you the keys. Arrival is 3pm onwards during the Summer months, departure is any time before 10am. There might be some flexibility, depending on our next booking - feel free to ask. Call us on 07514324455 or use the enquiry form to agree arrival and departure dates. We will hold those dates in your name for a couple of days. We accept bank transfers, cheques and Paypal. Yes, we ask for £100 damage deposit paid by cheque on arrival, which is usually destroyed immediately after your stay. We don’t mind about the odd broken plate or scuffed wall; that is fair wear and tear. Besides, we want you to relax and enjoy the cottage. The deposit would only be kept by us if something substantial was damaged, such as replacing a broken window or if we had to deep clean the cottage, if someone were to bring in pets or smoke on the premises, which we ask guests not to do. In booking Copperpot Cottage I accept: no smoking, no pets, no parties/events/additional overnight guests, the booking, payment and cancellation policy detailed above. Any other questions? Just call Nicci on 07514324455, email us at stays@copperpotcottage.uk or use this enquiry form.